For pull back option add $95 per foot. S models have 36″ x 36″ sides. M models have 40″ x 40″ sides. Steel cutting edges are standard. Rubber edges are optional add $32/ft. WARNING: Our steel edges do not Trip and can be very dangerous if you hit something. Please use extreme caution and inspect your plow area before the snow season for objects sticking up. 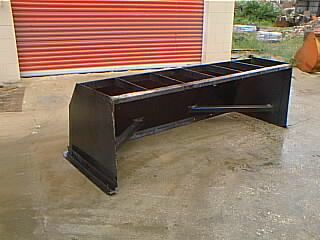 Our CUSTOMERS are requesting solid steel edges even tho the industry predominately use rubber. We are continually looking at ways to improve our product safety and durability for our customers. Freight is insane. If we can put multiple loads together we can split costs between customers.